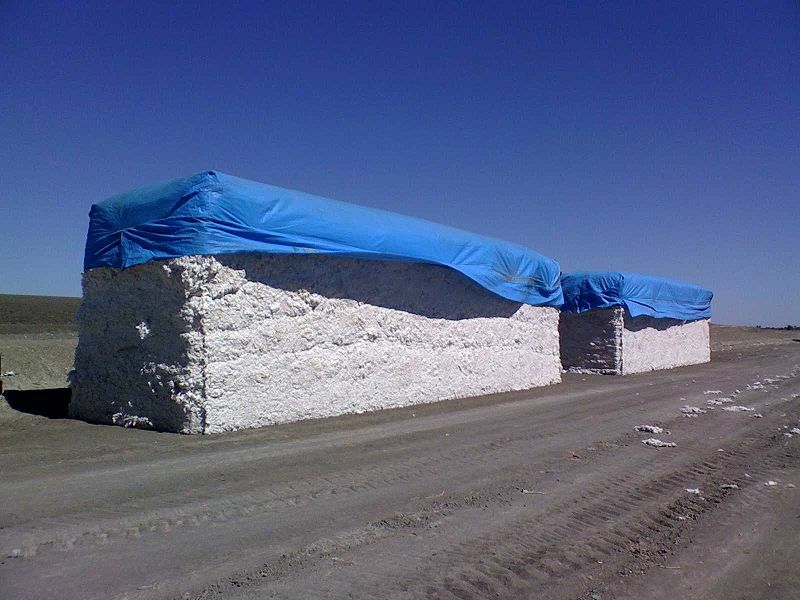 Cotton modules in Australia, courtesy of Wikimedia Commons. For several years ACES has serviced a 80s-era cotton gin with functional mechanical parts, but a legacy control system dating back to the 1990s. One day a Control Systems Inspector (CSI) was called to the scene when a relay output card failed on the bale press. This malfunctioning output card set off a chain of events that lead to a major upgrade and solved a long-standing puzzle. After research and investigation, the CSI ascertained that modifying the legacy software required uploading it to an early-90s computer, and using a handheld downloader to reinstall the modified program onto the ROM chip. It turned out that purchasing the special loader and all the time spent dealing with the obsolete software would cost almost as much as installing a whole new PLC. The CSI proposed just that to the customer and they agreed. The CSI installed the new equipment, including labeling all the existing wiring and transferring them to the new input and output card. Once he’d completed the installation and code conversion, the customer asked the CSI to look into a long standing issue with the module feeder table. Modules are 18-feet long bales of compressed cotton. Whenever the operator ran the dual-part table slower than 2 Hz for any length of time, the front and back tables would edge out of sync and begin to break up the module, causing the giant bale of cotton to fluff out everywhere and creating a huge mess. 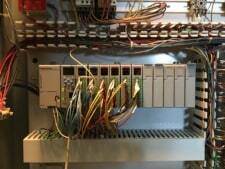 Over the years the client had added wiring, buttons and switches to try to solve the issue, without much success. Working with the obsolete program the CSI had never been able to investigate the coding firsthand. 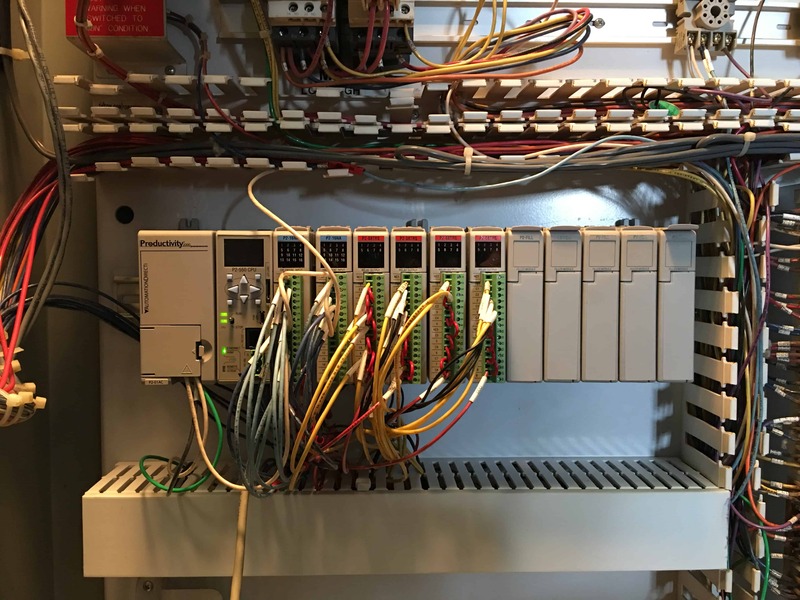 With the new PLC installed he was able to watch the logic in real time, and discerned that when the operator called for low speed, the system was actually pulling a high-speed contactor on the two-speed motor. Calling the high-speed winding was killing the torque needed for low speeds and causing all the headaches. New processor installed to run the bale press in a cotton gin. The CSI modified the program so it called the correct set of motor windings into play, and the module feeder table worked like a charm at all speeds, fast or slow. When he did the upgrade he knew that he’d be able to easily troubleshoot problems — but he didn’t expect to find a bug two decades old, hiding there ever since the 90s-era program was first installed. With a relatively small investment in a new PLC, the owner of the cotton gin was able to continue running the mechanical portions of the equipment — which were perfectly fine — and now he has a modern PLC that will last for 15-20 years. It allows for remote troubleshooting, saves hours of travel time, and makes upgrades, repairs and new equipment integration a snap. The cotton gin is now running so well, the customer has asked ACES to upgrade a similar machine in another location. ACES has years of experience keeping legacy equipment running at peak condition — and we can also tell you when installing new machinery or software will be more efficient and cost-effective. Give us a shout for a free estimate.